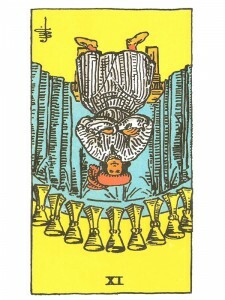 Nine of Cups (R) suggests greater awareness – the rejection of “surface” values. Never allow yourself to think that this is all there is! Remain loyal to your purpose, to yourself and to others. Having completed your work, prepare your mind to move on. You have the ability to integrate and balance your feelings in deep and expansive ways for your own emotional happiness and well – being and that of others and this will bring about victory and liberation. You may be overdoing it emotionally. The emotions may have become ends in themselves, goaded on by the ego. Everything exaggerated for effect. Sensitivity to a fault; your feeling everything – pain is everywhere. You could be thriving on the pain itself, rather than recognizing pain as the initial part of the positive lesson to be learned. A person stuck here may never get beyond the pain – a nasty form of addiction. In the first position: There may be times when your depth of sensitivity may be almost too much, too sweet, but those moments carry lessons meant specifically for you. In the second position: You may have constructed an ivory tower for personal enjoyment of your emotional/creative wealth and not have applied your gifts much toward practical rewards. In the third position: At one extreme, you may be somewhat overwhelmed at your emotional good fortune. At the other extreme, you may be somewhat disappointed. In the fourth position: One distortion here takes you to the extreme that is motivated by a distaste and avoidance for too much bonding/binding, preferring a much freer course. At the other extreme, the liking for familial or creative interrelationship and ties may be much too strong. Function outside of the group in such cases will be difficult to impossible. In the fifth position: The mind may be overwhelmed with the results in your Emotional Plane, either for the good or the bad. In the sixth position: Prepare for the extremes in your Emotional Plane. There may be disappointment or there could be a large demand on your energy, on your creative resources. In the seventh position: At one extreme is the nasty fear of things actually going too well…at the other extreme is the more easy to understand fear of failure in either relationships or creative matters. In the eighth position: You may be much too full emotionally to be truly strong. Do not take in too much before you balance with some giving. In the other extreme, you may not be strong enough at the moment for the emotional demands that are being placed on you – you may need to refill your cup some before you offer more drink to others. In the ninth position: This suggests tears, either of joy so great as to bring you to your knees or of profound sadness and disappointment. In the tenth position: The emotional demands placed on you will be substantial, but not beyond your ability to cope. At another extreme, the emotional attention showered on you will be taxing.